Why Twitter? In the getting-close-to-over-populated world of social media, Twitter in particular is a great tool to grow your business. How does this make sense when you can only post 140 characters? Well, that’s actually why it makes sense. Twitter is unique among social media networks. While they all have something that is uniquely theirs (or a copy of something that is uniquely someone else’s – let’s face it, most of them share something in common with someone else), Twitter is different in that it is a micro-blogging platform. Sure, there are other micro-blogging platforms. Tumblr comes to mind. But, I wouldn’t think of using Tumblr over Twitter for business. Plus, you can tweet your tumbles (or is it tumblings?)! Every tweet appears in your follower’s feeds. You can tweet images and build a conversation around them. You can follow potential clients and customers. You can organize people into lists. You can schedule your tweets (utilizing apps like Buffer) to go out at key times. 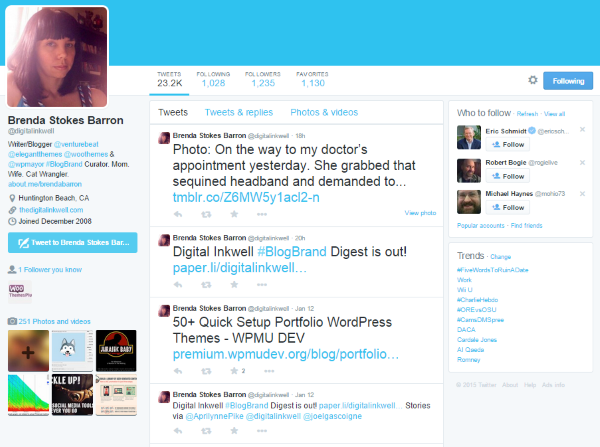 You can tweet your old posts form your WordPress site. You want your Twitter space to blend with your brand. This means using your logo, colors, fonts, user name, etc. This builds your business’s online identity and keeps it consistent. Your customers will know who they’re dealing with and it will look more professional. It will feel like an official business rather than a fly-by-night freelancer that might be doing something else tomorrow. Your Twitter user name will represent your brand. Just like your email account, your Twitter name should represent you as a professional. You wouldn’t send an email to a potential client from [email protected] (or a slew of any other crazy names you can think of), would you? I’ve gotten emails before from people wanting to help me improve my SEO. One name was something like [email protected] How do you think I responded to the email? Delete. I’ve also gotten emails with names like [email protected] (just made that up, but the idea is the same). Now I know, or at least get the impression, that I’m dealing with a professional. This person is more likely to get my business and it starts with my perception of professionalism. Look at the names you follow on Twitter and see why you follow them. For advice on improving your SEO, do you follow Whovian67, or do you follow thatSEOwarrior? That one’s easy. Unless you already know Whovian67, you won’t think of their brand for SEO. What about using your real name? That’s perfectly acceptable, especially if your name is your brand. In fact, you should use your own name if your name is your brand. By this I mean the name you use as your brand and not a shortened version of your name unless your full name isn’t available. If the exact name you want isn’t available choose the closest to it possible to remain consistent with your brand. There are two images for your profile: your profile photo and your header photo. This is the small square image that is placed on every tweet you send. For the best results this should either be a headshot of you or your logo. This is a large background photo that your visitors will see when they visit your Twitter page. This photo should match the branding of your website. Don’t leave valuable information empty. Your potential clients can learn more about you and it will help them make a connection to you and your brand. Location – your physical location. If you only do business online your actual location might not be relevant to the actual work you’re doing, but if your clients know where you are they think of you as a real person that they can relate to. Website – give a link back to your website so they can learn more about your business and you. They will want to see a portfolio with samples of your work. They will also want to read a few testimonials. They can’t do this on Twitter. You might also want to consider creating a specific landing page for your Twitter followers. Bio – tell them who you are and what you do. Keep it simple, you only get 160 characters after all, so don’t talk about the benefits of using your brand. Make this about you. Use your own personality and give it some flare and sparkle. Don’t just follow anyone at random. When you follow, you’re actually subscribing to their tweets. Follow people and businesses you know. Follow those whose tweets you find interesting and relevant to your business. Aggressive following is the practice of following hundreds of tweeters just to get them to follow you back. Many like to follow to get attention and then unfollow. This is known as the aggressive follow churn. This has been a popular method to attract attention on Twitter, and Twitter doesn’t like this practice. Twitter doesn’t restrict how many people you can follow, but they do monitor aggressive following practices. Aggressive following and the following churn can get your account suspended. Follow Twitter’s rules for best practices when following others. All of your followers can see everything you tweet. Keep your tweets professional. Keep your tweets relevant to your business mission. If your mission is to improve SEO, then tweet tricks and tips about improving SEO, books you’ve written or recommend, courses you’ve developed or recommend, news, the latest trends, where you see the industry going, and so forth. Don’t just tweet about what you can do for your clients. If all you tweet is ads about your company, your followers will just ignore you. You must give them a reason to follow and to continue following you. You must add value to them through your tweets. When you tweet tips that they actually use they will think of you when they need to hire a consultant, developer, writer, artist, programmer, or whatever you have to offer. You will also want to tweet links to your latest blog posts. You can do this by hand or you can automate it in a couple of ways. You can use a plugin that will post links to Twitter, or you can use an app such as Buffer or Hootsuite to post links from your RSS feed. Reply – clicking this button will open up a box where you can write a message to the author of the tweet. It includes the @ symbol and the person’s user name. This is a response to their tweet and will go on your message stream. It will also be connected to their tweet as a response, and in the mentions page (@connect) of that user. This is a public stream that others can read. Keep it professional and use it to add value. Retweet – this will send someone else’s tweet to your followers. It will remain the same as the original tweet and it will be counted as a retweet. This is a great way to share content with your followers. If you find something that would add value, retweet it. It will also get you noticed by the person or group whose message you retweeted. Mention – this is when you include the name of another Twitter user in your tweet. This is done by using the @ symbol. Mentioning a Twitter user will inform them of your tweet. It is a good way to get them to respond and add to the message stream or retweet your message to their followers. Direct Message – this is a private message that you send to another Twitter user. You can only direct message someone that follows you. It is a great way to have a private conversation. Favorite – clicking the star next to the retweet button places someone’s tweet into your list of favorites. Hashtags are used like tags to identify a topic. Readers can click on the hashtags and see other tweets, including tweets from people you do not follow, that use these tags. By using good hashtags, readers will be able to find and follow you. The key to successful tweeting is to tweet often. As the Buffer blog explains, there is no perfect answer to how often you should tweet. The key is to strike the perfect balance between being informative and being annoying. They tweet 14 times per day – once per hour from midnight to 10pm central time during the week, and 7 times per day on weekends from 3am to 9pm – about once every 3 hours. One thing you can do is tweet every hour on a schedule like this (use Buffer to schedule for you) for a few weeks. Then look at your analytics and see what times work best. Of course you will also have to take the topic itself into account, but this can tell you when the best times are for the topics you tweet about. First, stop and consider how your tweet will be perceived. Ask yourself some questions: Is it in good taste? Will it improve my customer relations? It’s okay to be personal, however you should use caution. It’s up to you how personal you want to get with your tweets. Not everything has to be 100% relevant to your customers and clients. They will expect to get tweets about business, and they might even appreciate tweets about Aunt Jennie’s cookies or your thoughts on Sunday’s football scores. It doesn’t have to be all business all the time. This is especially true if your business is named after you. In this case you are your brand and your followers can identify with you personally. It does, however, need to be professional. Don’t rant about your customers and don’t air out your dirty laundry for all to see. If you only want to discuss business then I recommend keeping separate accounts for business and personal use. Your website is where you do business. It’s your hub. It contains samples of your work, testimonials, and information that your clients need. Tweets are only so long and you can share so much more on your site that’s it’s worth the effort on their part to pay you a visit for more information about the topic. The easiest way to get your followers to visit your site is to place a link in a tweet. Use a URL shortener to conserve characters in the tweet. 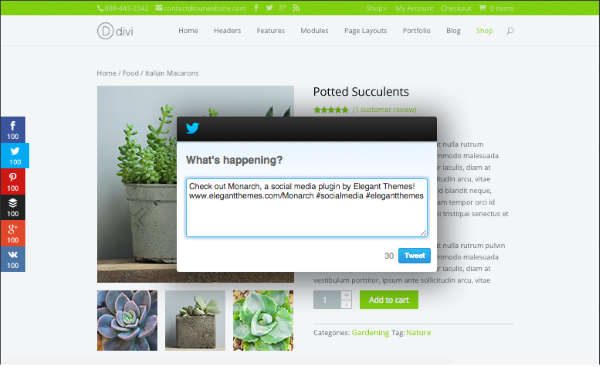 Bring your Twitter chatter into your website. Give your readers a taste of what you produce on Twitter. Give them a reason to follow you and a way to follow you. Here are a few easy ways to do this. To create the Twitter widget, go to Settings, select Widget, click Create New, make you choice, click Create Widget, and then simply copy and paste the HTML into your sidebar. Use social media sharing buttons to make it easy for your readers to find you on Twitter. The twutton. J Sorry, it couldn’t be helped. This will add share, follow, hashtag, and mention buttons to your site, and it’s very easy to do. Go to the Twitter buttons page, select a button, make your choices, and copy and paste the HTML into your site. Monarch is from right here at Elegant Themes. It has lots of features, buttons, and locations. It will even place share buttons on images and videos. It will do automatic popups and flyins with three different triggers: time delay, bottom of post, and on page leave. It has a dashboard where you can view analytics and configure your settings. Monarch is part of the Developer package that costs $89 per year. 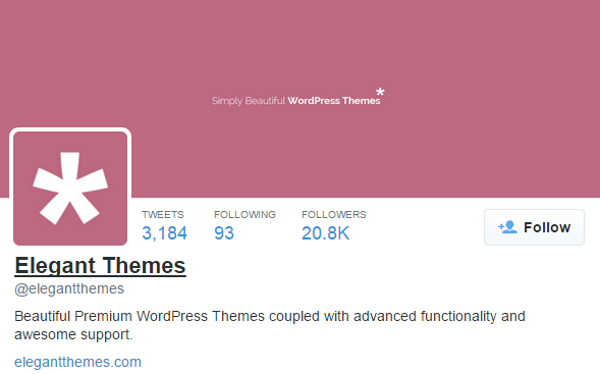 It includes access to all plugins, themes, PSD files, premium support, and more. Twitter is an excellent social network for building your business. It provides easy brand recognition, lots of communication tools, and it even keeps it simple. With a little bit of strategic planning and practice, Twitter can help you get clients, engage with them, and learn what they need. How about you? How do you use Twitter for your business? Do you have a tip to add? I’d like to hear about it in the comments below! Thank you Brenda for the information. I have had twitter for a while, but did not really understand the meaing it was there, All I did was just post whenever I thought I should. Now I have a reason, Thank you again!! Brenda, great info about how to use Twitter for business! It would also be helpful if your article (and Twitter) had better info about the proper size of profile and header images (file size and dimensions). The only thing I would have mentioned is the difference between a retweet and a “quote tweet”. Very useful article thank you. I need to step up with my Twitter feed. Very useful nugget Moelwyn about the number 1 errors – that was me! I have a problem with my Twitter page that I’ve set up recently – whatever I do, the header image of my Twitter page always gets blurry when I upload it. Any tips on making it not blurry? You might not be sizing the images correctly. Here is a chart show the image sizes for twitter. You write so well I’m now seeking and reading only your stuff out there. Your captive audience is expanding. They called it a social network, they called it microblogging, but it was hard to define, because it didn’t replace anything. There was this path of discovery with something like that, where over time you figure out what it is. Twitter actually changed from what we thought it was in the beginning, which we described as status updates and a social utility. One point though, Twitter does restrict the number you can follow (to a degree), probably to limit aggressive following. Once you hit 2000 it stops you until your followers catch up a bit.